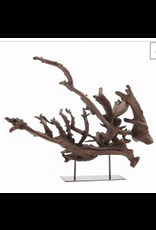 Natural tree root sculpture on iron base is dramatic visual design focal point. Available in 3 sizes including floor sculpture. Due to the organic nature, size may vary up to 10" height and width.